8 Comments for "Whole Wheat Blueberry Muffins"
Not sure whose kid approved these but they get 2 thumbs down from my 4 year old who says they are too sweet. How wonderful that your child has not developed a taste for sweetness. You can easily reduce the sugar in this recipe to 1/2 cup. And double check that the applesauce and blueberries don't have added sugar. Further reduction may cause texture changes in the muffin. The recipe has been tasted by over 1848 kids and 83% "Liked!" the taste. After making this recipe many times with both adults and youth as well as in my own home, I have come to see this recipe as an excellent base muffin recipe. I might even suggest renaming the recipe:) Diced fresh apple (add cinnamon), diced peaches, fresh cranberries (add orange zest) and any dried fruit work well in this recipe; the possibilities are endless. I also routinely reduce the sugar to 1/2 cup with no problems. No matter what version is made, these muffins are gobbled up. Blueberries can get expensive this time of year. I have found that diced apple is a nice substitute for the blueberries; I like to add a little cinnamon as well. I made these for our pantry project last month. 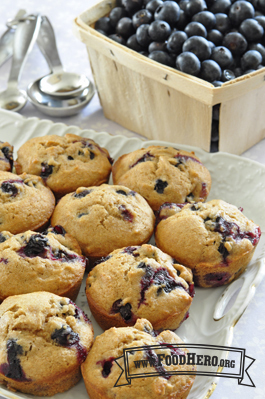 When I returned this month with a different recipe, people were still talking about how much they liked these muffins! A group of us sampled this recipe and really liked it but we would like to have a note added about using sweetened applesauce. How much should the sugar be reduced when using sweetened applesauce? That is what normally gets donated at the food pantries so it would be nice to have that as an added note. To use sweetened applesauce instead of unsweetened, measure the sugar then remove about 1 1/2 teaspoons of the sugar. This is about the amount of sugar in 1/2 cup of applesauce. We added it to the notes above. These were even better than we expected (all whole grain flour was yummy and you couldn't tell at all that there was applesauce in them). Note for us the batter was thicker than you would expect a muffin batter to be (the only variation on the recipe we did was use buttermilk versus regular milk) but they turned out as perfectly yummy, fluffy muffins.